Start shopping for deals on the Doro 8030 with TigerMobiles.com. This is the most intuitive and easy to use smartphone on the market, with a big bright screen, camera, and a host of attractive features for older customers. If you're in the market for a smartphone that doesn't require a degree to use, then start browsing our deals on the Doro 8030 below. If you’re not familiar with the name Doro it’s not too surprising. The Swedish manufacturer specialises in making devices for the older market niche. Designing mobiles for senior users and thoughtfully providing features like large type and hearing aid compatibility has made Doro the leading manufacturer in their field. The new Doro 8030 is a bit of an innovation for the company, though, a full touchscreen smartphone, rather than the bar-shaped “dumb” phones that Doro are better known for. Why should you want the Doro 8030? There’s that bright, large, easy to read screen, and plenty of battery power, along with an intuitive and easy to use interface. There’s a camera too, as well as a plethora of older-friendly features. If you’re in the market for a smartphone that’s as easy as pie to use, then the Doro 8030 is a clear choice. The Doro 8030 looks like any other touch screen smartphone, with curved corners and glass front cover. It’s a little chunkier than most, though, which serves to make it feel more robust and makes it fit more securely in hand. There are also three physical buttons at the front, along with an emergency assistance button on the back. Under the hood, you’re getting some nice internals too. Plenty of processing power, a decent camera, basic storage. But more importantly, there’s the user interface that’s incredibly intuitive and easy to use, making this model perfect for the less technically inclined. The Doro 8030 isn’t for everyone. It does, however, make an excellent choice both for older users and for the very young. Simple, easy to use, sturdy and robust, the Doro 8030 has a lot to offer the right buyer. While the Doro 8030 doesn’t have the high spec processing power you see on top end phones, those specs aren’t necessary here. It’s unlikely that you’re going to be high-end gaming here. However, there is quad core processing power, which should be more than enough to make the 8030 snappy and responsive. Essentially, this is an Android phone, running Android 5.0. But more importantly, Doro have overlaid a custom interface. Simply designed, this interface presents simple, basic icons that allow the user to access functions in one click. The home screen, for example, offers only three icons to choose from, call, view, and send. The 8030 is incredibly easy to use. Regarding performance, the Doro 8030 is more than satisfactory. It’s quick to respond to input and has more than enough power to handle what it needs to do. And that user interface means that there’s little to no learning curve here. Even if you’ve never picked up a smartphone before in your life, you’ll be tapping away on the 8030 in no time. Unlike most Doro phones, the 8030 is a full touchscreen model with no physical keyboard. And you’re getting a full 4.5-inch display here. That’s more than enough room to type on the screen, and makes a great canvas for your photos. All type is large font and easy to read too, perfect for those that may have vision problems. Resolution wise you’re looking at 854 x 480 pixels. Given that you’re not going to be watching HD video, that resolution is more than enough to make the 8030 look sharp and defined. Colour reproduction is excellent too, with whites looking stark and blacks truly deep. This display is going to be a Godsend for those who otherwise might have problems reading a smartphone screen. It’s bright and clear, large enough to see properly, and large size lettering means that it’s easy to see what you’re choosing. The Doro offers two cameras. At the front, there’s a VGA camera, which is perfect for video calling. At the rear, you see a 5+ MP camera, which should be more than adequate for shots of the grandkids. Again, the camera is simple to use, you just point and click, and you’re done! The Doro 8030 isn’t designed to be a camera phone, but those cameras do work surprisingly well. Easy to use, and producing clear, bright images, most users will be more than satisfied with the 8030’s photographic abilities. We do need to mention a few more things about the Doro 8030. You do have an internet connection so that you can email and even download (some) apps from the Google Play store. There’s GPS too, so you can use the map app to get directions. And the 8030 is compatible with most major brands of hearing aid as well. At the back of the 8030 you’ll find an emergency assistance button. You can programme in numbers (whether that’s a family member or emergency services) and should there be an accident, one push of that assistance button will connect you immediately to your assigned number. The 8030 also connects to My Doro Manager which allows you (or a helpful relative, no matter where they are) to control the settings and data on your phone from the internet. You should get plenty of juice out of the 2000 mAh battery, more than enough for a full day of use. And when it comes to charging you can either plug in a USB cable or slot the 8030 into the included cradle. Finally, the 8030 itself, along with each of its apps and icons, comes with a complete step by step tutorial that you can access at any time. So if you get stuck, help is right there on your phone! The Doro 8030 is the easiest to use smartphone on the market right now, and it’s perfect for older and younger customers alike. With plenty of friendly features, like an assistance button and large lettering, as well as a camera and even a web browser, the Doro 8030 is a fantastic choice for those who might not be ready for a more classic smartphone choice. You’re getting WiFi, Bluetooth, 3G and LTE connectivity here. And when it comes to internal storage, there’s a solid 8 GB of space. That should be more than enough or pictures, your address book, and a few handy apps too. So, anything that we don’t like here? Not really. The Doro 8030 is designed for a very specific purpose and it does its job beautifully. More memory is always nice, but we’re not going to quibble over that. 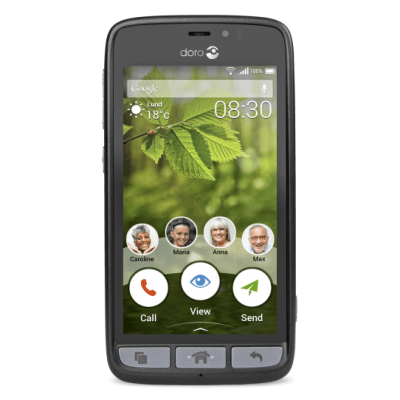 In short, the Doro 8030 is the perfect choice for either a first smartphone, or a smartphone for the older generation. It’s just so easy to use!